Powers/Abilities: Rudolf Parsons was a clever criminal who could handle a gun. He was nimble and handled projectile weapons like spears with seeming ease. He was also good at disguise and acting. (U.S.A. Comics#4/4 (fb)) - In the 1920s, Rudolf Parsons (then dubbed Repulsive Rudolf) masterminded the theft of $1 million from Falls National Bank and was aided by Ambrose the Ape and Jake Paskuniak, who received $20,000 apiece for their efforts. However, Rudolf informed the police and the two bank robbers were jailed for 20 years. (U.S.A. Comics#4/4 (fb) - BTS) - Rudolf's brother found out about his criminal activities, and offered to shield him and protect the family name by taking him in at Malamoor castle as Dr. Jurk, a live-in psychiatrist. Rudolf hid his loot in the monument to the medieval knight Black Arthur. He later adopted the identity of the Mad Monk, a dark legend associated with Malamoor, and occasionally ran around in a hooded cloak causing trouble. (U.S.A. Comics#4/4) - Pat Murphy was assigned to investigate the whereabouts of the stolen money given new clues, and took on his costumed identity of Vagabond. The two other investigators, Grogan and Kelly, looked into the appearances of the Mad Monk at Malamoor castle, where they were told by Penelope Parsons that she had called them, but this was overheard by Dr. Jurk. That night, Rudolf disguised himself once more as the Mad Monk but was spotted by Vagabond, and tried to eliminate Penelope, but was stopped by the sudden appearance of the two investigators and the newly arrived two former partners of Rudolf. The Mad Monk quickly jumped through a window to escape, returning shortly after to impale Paskuniak before the ex-crim could tell his suspicions regarding the Monk's identity. Rudolf again escaped. Vagabond's arrival distracted the shocked people, although Ambrose looked for the hidden money in another room, suspecting that it was hidden in the armor monument. However, the Mad Monk was watching and shot him before running off, although with his last breath Ambrose told the others that Rudolf was the Mad Monk. Rudolf, back in his role as Dr. Jurk, was assembled with the others by Vagabond and the two D.A. investigators, but this yielded no resolution to the investigation. Later that night, Vagabond examined the armor of Black Arthur and discovered the loot, but was attacked by Rudolf, now the Mad Monk again, but was knocked out by Vagabond. Comments: Created by Ed Winiarski (writer/artist) and an uncredited inker (possibly George Klein). So why did Rudolf decide to take on the identity of the Mad Monk? He was cited as the "mad brother", but potentially took on the role to scare off his brother and niece to keep the castle and loot to himself. At the end of the story, Vagabond called the inert form of Rudolf as his "mortal remains", so did Vagabond kill Rudolf with two mighty punches? In the story, Malamoor was an ancient Scottish castle that had been transported piece by piece to America. In the story, Black Arthur was said to have fought for Mary, Queen of Scots (ca. 1560s). Interestingly, there was a Black Arthur Forbes in Scotland around this time who was killed in a clan war (1571). However, the Forbes clan supported Protestantism at that time, which runs counter to this Black Arthur's support of the Catholic Mary. 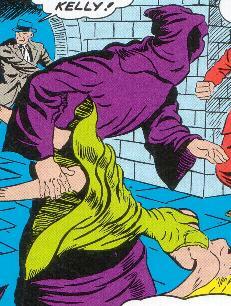 It's suggested in the hardback Marvel Masterworks reprint that the inker was George Klein. Ambrose the Ape helped Repulsive Rudolf rob a bank and was given $20,000 of the loot; however, Rudolf informed the police of his whereabouts. He was imprisoned for 20 years and joined Jake Paskuniak in tracking down Rudolf at Malamoor castle, where they met Vagabond and the residents of the old castle. Unfazed by Jake's bloody murder at his side, he investigated where the stolen money could be but was shot by Rudolf, disguised as the Mad Monk, when he came too close to the hidden stash in the Black Arthur monument. Mr. Parsons (first name unrevealed) was Rudolf's brother. He found out about Rudolf's involvement in a major bank robbery and took him in at his residence at Malamoor castle to shield him from the police and protect the family name. He had become nervous with the new appearance of the Mad Monk but resisted police involvement. Penelope Parsons was the niece of Rudolf. Her college days over, she returned to her father's residence at Malamoor castle where she saw the troublesome shadows of the Mad Monk. Frightened, she informed the D.A. 's office regarding this, with Grogan and Kelly arriving to investigate. That night, the Mad Monk attacked her but she was rescued by the two police officers and the timely arrival of Rudolf's two former accomplices. Soon after, she was told all that had happened. Jake Paskuniak helped Repulsive Rudolf rob a bank and was given $20,000 of the loot; however, Rudolf informed the police of his whereabouts. He was imprisoned for 20 years and joined Ambrose in tracking down Rudolf at Malamoor castle, where they met Vagabond and the residents of the old castle. He was killed by a harpoon-like spear thrown by the Mad Monk when he was about to voice his suspicions as to the identity of the Mad Monk. Black Arthur was a knight who served in the battle to save the crown for Mary, Queen of Scots (presumably the mid-1500s - see comments). A memorial, mounted with his assembled black armor, was based inside Malamoor castle. The Mad Monk hid his cash in the base, where Vagabond later found it. It's not confirmed, but Black Arthur may have been an ancestor of the Parsons given the connection with Malamoor castle.